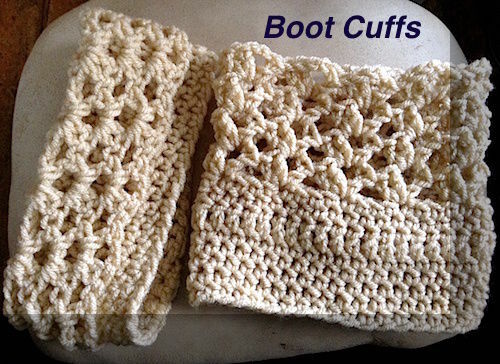 There are some beautiful boot cuffs out there waiting to be made so I thought I’d start out with something rather simple. Sc along the chain (35 stitches) and join to make a circle at the end. repeat this row for a total of 5 rows of the “lace” that folds down over the boot top. I made these last night and I love them! I hope you post a photo!!! I’d love to see them with a pair of boots. My daughter was here today and I had her try them on so I could take a picture — and how wonderful that the shawl that she was wearing pretty much matched the boot cuffs!